The trial of two former executives of a Swiss building firm accused of negligence in some 2,200 asbestos-related deaths has opened in Italy. Swiss-born Stephan Schmidheiny and Jean-Louis de Cartier, of Belgium, were shareholders in building firm Eternit. The prosecution alleges thousands died from contact with asbestos fibres processed in four of the firm's plants. Neither of the two accused - who have both denied wrongdoing - were present at the trial, in the city of Turin. Italian media are calling the case, in which almost 3,000 people are seeking damages, the "trial of the century". Mr Schmidheiny alone has a team of 26 lawyers working on his defence. Interest in the case was so high that the trial took over three courtrooms in the northern industrial city and hundreds of relatives and journalists watched proceedings via videolink. 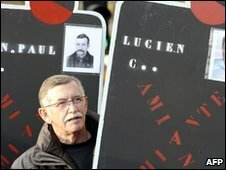 Outside, demonstrators and relatives of victims who worked at other Eternit plants in Europe held placards calling for justice. The two suspects - one a Swiss billionaire and the other a Belgian baron - are being tried in absentia. They are accused of causing an environmental disaster and failing to take proper safety measures. If convicted they could each face 12 years in prison. Prosecutors say they are ultimately responsible for breaches in work safety rules that directly led to the deaths of 2,200 people and made several hundred others who lived and worked near the four plants ill.
"The trial will be just," public prosecutor Raffaele Guariniello said as the case opened. "And it will take the time we need to give justice both to the victims and those accused."